Greek astronomy is the astronomy of those who wrote in the Greek language in classical antiquity i.e. see Aristarchus of Samos Greek astronomer/mathematician and his heliocentric model of the solar system. Greek astronomy is understood to include the ancient Greek, Hellenistic, Greco-Roman, and Late Antiquity eras. It is not limited geographically to Greece or to ethnic Greeks, as the Greek language had become the language of scholarship throughout the Hellenistic world following the conquests of Alexander. This phase of Greek astronomy is also known as Hellenistic astronomy, while the pre-Hellenistic phase is known as Classical Greek astronomy. During the Hellenistic and Roman periods, much of the Greek and non-Greek astronomers working in the Greek tradition studied at the Musaeum and the Library of Alexandria in Ptolemaic Egypt. 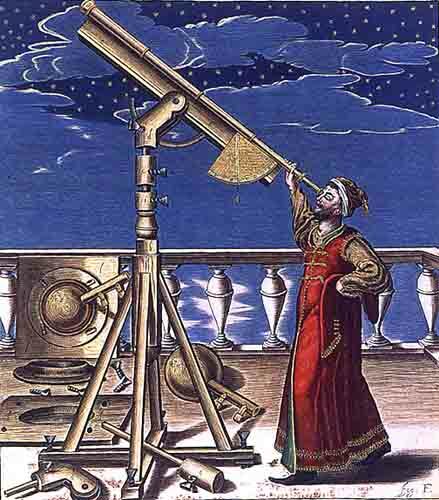 The development of astronomy by the Greek and Hellenistic astronomers is considered by historians to be a major phase in the history of astronomy in Western culture. It was influenced by Babylonian astronomy; in turn, it influenced Islamic, Indian, and Western European astronomy. Most ancient civilizations watched the heavens as patterns in the sky that allowed the to know when the seasons changed - among other things. They built great stone monuments called astronomical observatories such as Stonehenge as celestials clocks to mark these events and the passage of time. They believed their gods lived in the skies and named them and the constellations after them. This is the reason astrology, astrology and mythology all follow the same patterns. In the end - the answers are in the sky as they come from above. In metaphysics we call this moving into higher frequency than what we experience in our third dimensional bodies. Our creators are from higher realms. They have powers that are lost to us in the physical body. Many seek to activate those powers now. Since the first Egyptian farmers discovered the annual reappearance of Sirius just before dawn a few days before the yearly rising of the Nile, ancient civilizations around the Mediterranean have sought to explain the movements of the heavens as a sort of calendar to help guide them conduct Earthly activities. Counting phases of the moon or observing the annual variations of day length could, after many years of observations, serve as vital indicators for planting and harvesting times, safe or stormy season for sailing, or time to bring the flocks from winter to summer pastures. With our millennia of such observation behind us, we sometimes forget that seeing and recording anything less obvious than the rough position of sun or nightly change of moon phase requires inventing both accurate observation tools (a stone circle, a gnomon used to indicate the sun's shadow, a means to measure the position of stars in the sky) and a system of recording that could be understood by others. The ancient Greeks struggled with these problems too, using both native technology and inquiry, and drawing upon the large body of observations and theories gradually gleaned from their older neighbors across the sea, Egypt and Babylonia. Gradually moving from a system of gods and divine powers ordering the world to a system of elements, mathematics, and physical laws, the Greeks slowly adapted old ideas to fit into a less supernatural, hyper-rational universe. As ancient peoples began to realize that sun, moon and stars follow certain rhythms in step with the seasons, they made the leap of thought to postulate that some conscious set of rules must be dictating these movements and seasonal changes which, for agrarian or pastoral societies, were a matter of life or starvation. Who or what could be causing these all-important changes to come about? Certainly nothing on earth, no beast or human, had the power. Thus gods were born. There are hints of the Greek conception of the universe in Homer, who mentions many subjects on his two epics describing war and the perils of trying to come home after long absence. For Homer, heaven is a solid inverted bowl (Od. 15.329 sideron ouranon) straddling the Earth, with fiery, gleaming either above the cloud-bearing air. (Il. 14.288 `fir-tree reached through the air to the ethers). Homer mentions the movements of sun, moon, and many stars by name. The fact that Hades is on the underside of earth has an important impact on conceptions of heaven: it is unlit by the sun (in Homer and in Hesiod), therefore, the sun--and by extension, other heavenly bodies - must sink only to the level of Ocean, which is as a river circling Earth's edge. From it the Sun must also rise -though how it gets back to the eastern bank of Ocean is never explained. These popular conceptions of sky are more fully explained in Hesiod, whose works on gods and on agriculture and animal-herding are more closely connected to the practical application of astronomy. He clocks spring, summer, and harvest by solstices and the rising and setting of certain stars, and notices that the sun migrates southwards in winter. Night is a substance welling up from under the Earth, as if it were a dark flowing mist. One early and popular cult, that of Orpheus, developed its own of gods and universe-creation variant from those in Homer and Hesiod; there, a primeval egg is birthed by the early gods, and the upper half of its broken shell becomes heaven's vault. Various cults, cities and tribes of Greeks (who were unified only by language and common culture, and both of these had regional variants) probably had different versions of cosmogony and slightly different gods in charge of astronomical movement, but the general physical conception of the sky is alluded to by many authors of plays and other popular works (Eur. Melanippe 484), and was probably held by the majority of people. Many Greeks settled on the coast of Turkey in the early migrations of the eleventh century BCE, and there enjoyed rich cultural mingling with their neighbors (and sometimes their conquerors) the Lydian's and Persians, latest descendents of Mesopotamian civilization. The freshwater conception of the Ocean river is seen by many scholars as a telltale sign of early adaptations from that ancient `between the rivers' people. They kept in touch with their western cousins, who began a second wave of settling across the Aegean in the seventh century, as well as with other rich sea-faring cultures like Egypt. It is not surprising that, by the sixth century, these Ionian navigators of the sea began to develop new ideas about the sky they steered by. The most fundamental of these was that the universe might run, not only by the whim of gods, but by physical, mechanical rules and principles that might, through study, be understood and predicted. Our sources for all early Greek astronomy are scant, none more so than for Thales, supposedly the first of the philosophers. Various inventions and discoveries are attributed to him, most famous of which is his prediction of an eclipse of 585. Modern scholars are fairly sure he was able to do this by consulting known Babylonian eclipse and lunar observations going back about 150 years, long enough to notice that eclipses recur after about 18 years. His activities also seem to have included star-observations and trigonometry, which he is credited with having founded, but the details of his theories are either lost or obscured by later legends about this early thinker who left no written record. He seems to have conceived of earth as flat and water-borne, and to have postulated that there must have been some first substance out of which the world arose, which he guesses is water (Aristot. Met. 983b 6). The earth for Anaximander is still a cylinder circled by air and then fire "like the bark of a tree" which separated off at an early stage. We still see echoes of the early cosmologies here, but an attempt is made to explain the scheme in purely physical--in fact, in mathematical--terms. The heavenly bodies are all described as wheels of fire (Homerically described as like chariot wheels) enclosed by are via a further separating-off. Their light which we actually see is only a part of them, described as an axle, pipe, vent, or bellows-nozzle, through which fire jets. Eclipses and lunar variations are accordingly caused by these vents opening or partially closing. All these ideas are attempt to explain the universe in physical terms, though as yet there is only the vaguest theory as to why these things are so. Anaximander seems to suggest a process of separation and "equilibrium", with the earth suspended in the middle and the various heavenly bodies "balanced" all around it by some unseen rule. Here, as with all the early thinkers for whom direct quotes are almost non-existent, we must be cautious about later sources who tend to read later theories into earlier philosophers' ideas. Yet with that caution in mind, we can see by Anaximander's "equilibrium" (and the "condensation" of Anaximines and all his successors, next section) that the Greeks were beginning to be aware of gravity but still needed to put two and two together and recognize it explicitly. The third of the Ionian thinkers refined the flat-earth idea, suggesting that all things are produced through a process of gradual condensation and "rarification": earth condenses out of air, and fire is "exhaled" from the earth. The earth and heavenly bodies are flat and loft on infinite air like a leaf. Celestial bodies do not set beneath the earth, just as in mythology, but instead turn at an angle (the axis of rotation, after all, is visible to us in the northern part of the sky) so that many are obscured by the "higher" parts of earth to the north. Xenophanes of Colophon (c. 570-490 BCE) migrated from Ionia to Italy fleeing the Medes' takeover, bringing Milesian theory with him. Although largely concerned with de-anthropomorphizing god to make it infinite and all-encompassing, he propagates the view of heavenly bodies condensing into fiery clouds from Earth's exhalations (Aetius 2.20.3). His heavenly bodies, like Anaximines', follow circular courses (conceived as bands or zones) and are obscured behind high parts of the Earth. Heraclitus of Ephesus (c. 500 BCE), though criticizing his predecessors' work as data, not understanding, continues the idea of creation through balance of different substances and the process of condensation, this time, from fire. Night is formed of murkier exhalations from earth (as from Tartaros in Hesiod above) and day from exhalations ignited by the sun. Sun, moon, and stars as fire caught in bowls, which tip away to cause eclipses and lunar phases. The moon travels through the less purified air close to earth, so is dim, and the sun is the closest and thus brightest and hottest of stars. The later of these "Presocratic" philosophers began to specialize, develop, and apply the systems of empirical observation and deduction which their predecessors had invented. Some, like Parmenides and Zeno, concentrated on exposing the fallacies and logical traps to which the first uses of analytical thinking often fell prey. Others, like followers of the semi-legendary Pythagoras, used their theories about how the universe worked to develop new ideas of divinity, astronomy, universal harmony, and mathematics, and extended these ideas to dictate a proper, "harmonious" lifestyle. All these continued to refine and argue over the basic precepts put forth by the Milesian thinkers. Empedocles of Acragas (mid 5th cent. BCE) works on a system to reconcile the "unchanging" universe of Parmenides' sphere with chaotic, differentiated matter by having the universe in a state of flux (as in Heraclitus) between harmony and strife. Along the way, he propounds an outer, hard universal sphere upon which the stars are fixed, and an inner sphere of double hemispheres, one of lighter fire for day, one of darker for night. The sun and moon are not physical bodies but concentrated, polished spots on this inner surface which reflect the outer fire. Anaxagoras, friend of the Athenian statesmen Perikles and thus slightly younger than Empedocles, follows the usual theory of separation and condensation, but his heavenly bodies are again solid objects . His most important contribution to astronomy was the claim that the moon's light is a reflection of the sun and that eclipses of the moon were caused by earth's shadow, eclipses of the sun by the moon passing before it. The Pythagoreans first proposed a non-geocentric system, perhaps partly on the basis of moral and religious grounds: to them, humanity and earth were imperfect, and only by sacrifice and a strict regimen of personal conduct could one strive to reach the divine. Accordingly, they placed the divine, poetically called the "Hearth of the Universe" or "Throne of Zeus", at the center of a finite, spherical universe. The sun is a glass sphere which catches and reflects this hearth-light. A counter-earth, the "antichthon", had to be invented, supposedly to make the number of planetary spheres ten. These include the five visible planets out through Saturn, earth, the moon, the sun, and the heavenly sphere on which were the stars. Heath, in outlining this system, suggests that the counter-earth was invented to account for the frequency of lunar eclipses. The counter-earth also solves a major problem in this view, serving to eclipse the Hearth-Fire so that we never look God in the face, so to speak. The concepts of number, harmony, and music all influenced the Pythagoreans to invent this fully-realized version of the concentric celestial orbits, which resonate with "the music of the spheres". The atomists Leucippus and Democritus in the generation preceding Socrates refined the various pre-Pythagorean views of space: there is a drum-shaped earth (in Leucippus), condensation is the falling-together of atoms, and centrifugal force helps keep the earth and bodies of fire in place. Leucippus was probably from Miletus, and Democritus from Abdera; their development of atomic theory was a refinement of two centuries of Ionian scholarship. In keeping with these theories now becoming prevalent, the early fourth century mathematician Eudoxis of Knidos mathematically described the idea of concentric spheres, anticipated by the "wreaths" and "zones" of many earlier scientists and probably assumed by the Pythagoreans. Having discovered a theory of the solar, or rather, geo- system which accounted for all visible phenomenon (and was, moreover, aesthetically pleasing), subsequent astronomers and philosophers fine-tuned the idea for their particular fields. The philosophers dwelt on harmony, cycle, and a new scheme of the divine; the mathematicians, a description of heaven in the marvelous language of geometry which was nowhere else in the physical world more eloquently expressed. Sophisticated three-dimensional moving systems were worked out by various geometers to account for observed inconsistencies in their basic theory. It would take many centuries before anyone had accurate enough observations to realize that the theory could not account for all data. By then, people would have even more difficulty letting go of their clockwork, geocentric, "divinely subsidized" universe than the Greeks, who had placed their version of a Bible, the Homeric and Hesiodic myth-cycle, into the realm of metaphor after executing only one gadfly of a philosopher. A celestial event seen by the ancient Greeks may be the earliest sighting of Halley's comet, new evidence suggests. According to ancient writers, a large meteorite smacked into northern Greece between 466BC and 467BC. The writers also described a comet in the sky at the time the meteorite fell to Earth, but this detail has received little attention, say the researchers. Comet Halley would have been visible for about 80 days in 466 BC, researchers write in the Journal of Cosmology. New Scientist magazine reports that, until now, the earliest probable sighting of the comet was an orbit in 240BC, an event recorded by Chinese astronomers. If the new findings are confirmed, the researchers will have pushed back the date of the first observation of Comet Halley by 226 years.